In this tenderly crafted story of a man who, in the face of one of his toughest moments in life, buys a boat and sails the Northeastern Caribbean to provide for his family, Juliana Magliore creates a great tribute to her father. He plied the waters of the islands trading goods back and forth, always returning to Dominica and the small tightly knit community of Glanvillia, where each person supports the other in their times of need. The story brings alive what life was like for the simple heroes living their daily lives amidst struggles that few of us can imagine. It is not a sanitized story, but rather an honestly crafted biographical sketch that took 82 years to form. For Bo, Juliana’s father who passed away in 2003, the sea brought peril along with salvation. He always maintained a positive and highly spiritual attitude, he always made people smile, and he always came back from the sea. It’s that relationship with the sea, somewhat mystical, always respectful, that Juliana examines. With each detail, she uncovers a new understanding of the man, his nature, and his special relationships with the sea, with the people, and with God. She then relates that understanding into spiritual principles that now guide her life and perhaps yours as well. 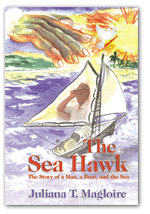 The Sea Hawk is self-published and available from www.seahawkpublishing.com. Juliana is currently applying her doctorate in International Relations by working with government agencies throughout the Caribbean to establish the Annual Sea Hawk Regatta. The Regatta is intended to begin and end in beautiful Dominica, and will follow a circle route among the islands, with cultural events planned for each stop. 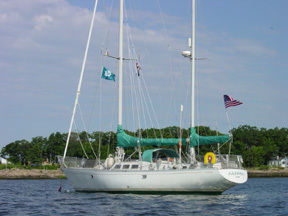 Proceeds will be donated to charitable institutions, such as the boat building school in Dominica . Interested parties may contact Juliana at shb@seahawkpublishing.com.